Looking for the ultimate overseas family holiday? Somewhere that has beautiful year-round sunshine, pristine beaches, a relaxing vibe, ultra-friendly locals and amazing accommodation? Well, dust off your passports and say “Bula” to days or weeks of chilled-out bliss because a tropical Fijian oasis awaits you … and it’s just a four-hour flight from the east coast of Australia. 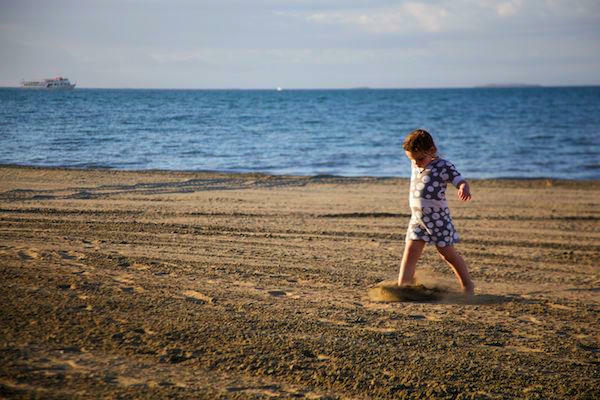 After researching the plethora of family-friendly accommodation available, our Babyology road-tester chose to say at the Fiji Beach Resort & Spa by Hilton, located on Denarau Island. And even though expectations were high, it didn’t fail to impress! The resort is just a quick twenty minute taxi ride from Nadi airport but a world away from the hustle and bustle of this tourism epicentre. Luxurious but down-to-earth in its child-friendly vibe, resort staff are so welcoming and friendly. Every family member is taken care of: there’s the stunning eighteen hole Denarau Championship Golf Course from which to tee off, and, of course, the amazing day spa with everything from indulgent treatments inspired by ancient Fijian rituals to the divine-sounding Four Hands Massage. But let’s not kid ourselves – a family holiday is only considered a success if the junior members of the team have an awesome time. And for most kids, that means there must be a bucket-load of water activities on tap. The resort has seven (yes, seven!) pools to take a dip in – there’s everything from kids’ pools, where splashing about and having fun is encouraged, to the glamorous infinity edged pool that seems to stretch endlessly into the sparkling Pacific Ocean. Speaking of oceans, the resort has more than a kilometre of private beach to explore – so we’re guessing family time is going to consist of countless sandcastle-building competitions and snorkelling amongst the spectacular coral. They don’t call Fiji the Coral Capital for nothing! Now, back on land… so that you’re not hit with the job of activities director twenty-four/ seven, the kids club is open from 9am to 5pm for children under thirteen (children under four must be accompanied by a parent or nanny, but day and night nanny services are available). The kids club itself is five star, with an outdoor play area and two activity rooms. To keep things interesting, the organised activities are changed daily and are age-appropriate, with beach games and treasure hunts for the younger kids and Fijian craft-making for the tweens. All this activity makes for very hungry little tummies, so it’s good to know that kids under four eat for free at all mealtimes, and there’s a kids’ dinner buffet at 5pm every evening during school holidays. The food is absolutely delicious and there are a few locations from which to choose – try Nuku bar, which sits directly over the beach; Maravu, which specialises in Pan-Asian cuisine, and L’Epicier, which is renowned for its coffee, pastries and gelato. Or order a gourmet BBQ pack for your accommodation’s private barbecue (note: not available in studio rooms). You get to do the fun part of creating the sizzle and the boring washing-up part is magically taken care of by the resort staff. Of course, there’s also twenty-four-hour, in-room dining, which includes an extensive children’s menu. As you’d expect from such a magnificent resort, the accommodation is stunning, with all the luxuries of home. It ranges from studios and one-bedroom suites to five-bedroom homes. Our Babyology road-tester stayed in a two-bedroom beachfront villa and found it large enough for a family of four. There were two huge bedrooms and bathrooms, a fully-equipped kitchen, washing machine and dryer, air-conditioning, two large flat screen TVs, high-speed Internet and a PlayStation, as well as CDs and DVDs. And, of course, the aforementioned barbecue. With all this luxury, we wouldn’t blame you if you never wanted to leave the resort, but it’s good to know there’s the Bula Bus service if the family wants to do some sightseeing. The bus travels all over Denarau Island, including the vibrant port village and marina with its buzzing shopping, restaurant and bar scene. Or, you can choose to resort hop; the bus can take you to any other resort on the island, where you are welcome to use the facilities. And to make getting out and about as fuss-free as possible, the Fiji Beach Resort & Spa has baby strollers, kids’ bikes and child-seat attachments for hire, so there’s no need to lug all that bulky but essential gear over on the plane. Now, that’s what we call family friendly! The Fiji Beach Resort & Spa has a Sport N Fun 4 Every 1 package, available until January 31, 2011. Prices start from $639 FJD (approximately $360 AUD) per family of four per night, and includes accommodation (minimum five-night stay) for two adults and two children in a two-bedroom apartment, daily breakfasts for four at Nuku restaurant and two Adrenalin Watersports passes.